2. Do you have a wonderful “Cousin Bait” blog story? A link to a previous blog post might answer this question. Last year I started writing a post about the people I had come in contact with, related and otherwise,thanks to Western District Families. The post was getter longer and longer and needed fine tuning, so I put it away for a while, well, quite awhile. Finding cousins was never my intention but the number of connections I have made is amazing. I will mention a couple here, but I will get on with my “Finding Cousins” post to celebrate my new found cousins. The research room at my local library is a place I frequent at times, but it wasn’t until I wrote about my Mortimer family that I found out the research librarian, Edie, is my fourth cousin 1 x removed. We also have a link through the Hadden family through marriage. To think I have been there researching the Mortimers and another Mortimer descendant was only metres away! Fellow blogger Kerryn Taylor from AncestorChasing is related through the marriage of her gg grandfather George Adams and my ggg aunt Sarah Harman (both second marriages). This is a special link beyond our blogging connection. Finally I must mention my 1st cousin 1 x removed, Warren Gamble who I have only connected with since I been blogging. Warren is an enthusiastic researcher of the Gamble family tree and connected families and is a great supporter of mine, often leaving comments of encouragement. Thanks Warren. We will catch up in person soon. Over the years I had gathered stories and facts about my various families and I was looking for a way to share or organise everything. Blogging was the answer. I was going to call my blog My Western District Families but I changed it to Western District Families because it gave me room to move with the content. I post on Twitter and the Western District Families Facebook page. I also post on Google+ . If the post is specific to the Western District, I will post it on the Western District Families Google+ page or if it is a general genealogy post, I will post it on my personal Google+ page. I also use StumbleUpon for most posts and Pinterest for visual posts. There are now 92 followers of the Western District Families blog and they either receive an email with each new post or if they are WordPress subscribers, they view each new post on the WordPress Reader. I think a search box is important, especially with so many family names. I also use a category list, tags and an archive list, just so it easy to find posts. I use all these features myself to get around the blog. The RSS feed and the subscribe widgets are important to get posts out there. I did have a Trove search box. The graphic didn’t install properly but the search function worked. It had been on the side bar for months when I just had to fiddle. I removed it with the aim of re-installing it, hopefully with the graphic. Bad move. Now the box doesn’t work at all. I have a person to contact at Trove to discuss it, but time hasn’t permitted . The essential purpose of Western District Families is to share the stories of my Western District Families with snippets of social history, with the intended audience those with the same family interests. The audience has evolved and is now multi-layered – Those with the same family interests, those with Western District families, local history enthusiasts and those with a general interest in history. Passing of the Pioneer posts and the Trove Tuesday posts have broadened the audience, as have horse racing posts and the Adam Lindsay Gordon post. I enjoy when visitors to the blog are those that would not normally visit a history blog. I have found there is an interest in history out there, but for some the topic needs to be something they can relate to and “hometown history” does provoke interest. I have posted links to Hamilton history blog posts to my Facebook group, “I’ve Lived in Hamilton, Victoria” and they’ve been met with interest. People do like to recall how things were and rekindle memories of their childhood or youth. You only have to look at a new Facebook page Have You Seen Old Ballaarat Town? In just over four weeks it has attracted over 5000 “likes”. It was surprising to see that some of my friends that prefer the offerings of popular culture had “liked” the page before me. A similar page Stawell’s Views by Old Time Photos is pushing 1000 “likes” after a couple of months. Keeping the content light, fresh and identifiable are some of the keys to taking history to the masses. One of my biggest blogging thrills to date was hearing from Samantha. After visiting Shelly Beach near Portland and reading my post The Sultan of Shelly Beach, Samantha’s primary school age daughter wrote about Shelly Beach, the Sultan and the camels for an “interesting facts about Australia” school project. 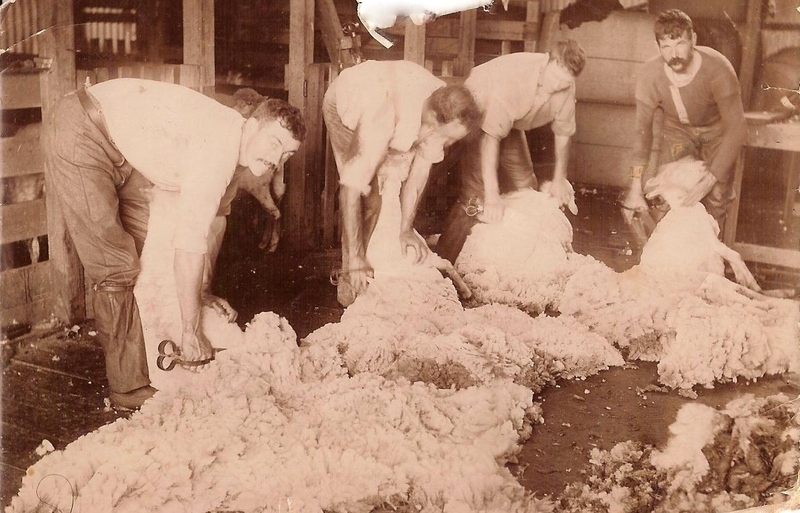 As a child I read a lot of Australian history and it was stories like those of Sultan Aziz and my many Trove Tuesday animal posts that attracted me. I got hooked and if just one child gets hooked on history because of Western District Families, I’ll be delighted . The posts that involve the most research such as Everybody Happy? about Rupert Hazell, Alice Hawthorne – The Western Mare, On the ALG Trail and Ship Mates. Finding time to read other blogs has been difficult of late, but the WordPress Reader is convenient to keep track of WordPress blogs I follow. I also have RSS feeds at the top of my browser for the blog posts I don’t like to miss including Geniaus and the Gould Genealogy & History News. Those blogs often lead to me to other blogs of interest. 13. What new features would you like to see in your blogging software? It’s not really something I’ve considered. 15, Are you a sole blogger or do you contribute to a shared blog? I plan a little more than I used to, so I start off the month by coming up with a working title for each post I plan to write during the month ahead. That’s become easier with Trove Tuesday each week and a monthly Passing of the Pioneer post always scheduled for late in the month (very late this month). Then I only have to come up with another three or four other post ideas. Most times I have drafts carried over from earlier months. My draft list has ideas that go back 18 months but when I’m short of ideas I can return to them. As soon as an idea comes to me I start a draft with at least a title, just so I remember. Sometimes an unexpected post may come up (such as this one) and I need to reschedule, but I look at on the bright side, I will still have something to write about in following months. Some posts can take a few weeks, depending on the amount of research involved. The posts I have listed under Question 10. are an example of those. I work on posts concurrently but each post maybe at different points of preparation. I usually begin with the photos or newspaper clippings I have gathered and then put the words around them. The Fashion and Christmas posts have been most time consuming in this respect due to the number of images. Often I find myself composing posts in my head when I’m away from a computer (…very sad) such as cooking dinner, at work, trying to sleep… some ofs my better opening and closing paragraphs have come that way. Yes, one of the first things I did. To help with the Western District Families content, obviously Trove and the Victorian Heritage Database have been very important. To improve the blog overall, I keep up with articles I find through Twitter and Facebook about both geneablogging and blogging in general. One of the sources I use for links is the Blog Chicks Facebook page. Just go for it. Don’t take it too seriously and most importantly, have fun. I do! If you would like to read what other geneabloggers have written, see Jill’s post – Feeling the Love – Responses to The Bloggers’ Geneameme. Your blog is making such a valuable contribution to the local history of Victoria’s western districts. From reading your regular posts it is evident that you put a lot of time and effort into them as you have done with the responses to this geneameme. Thank you so much for your detailed and thoughtful responses, I have enjoyed reading them and hearing about the way you work. A great contribution to the meme! Thanks for posting. Another Great Blog, you have got me Hooked into history, not only Victoria all Australiaall tied in with family. Decided to follow my daughters married name Marriner, it goes back to Willam Mariner. Convict on first fleet.\, carries on to Second fleet and Sydney Cove and Norfolk Island.Also my Mothers Family, Richard Warren owned Ovens Murray Observer from 1854 until he died in 1906. hour I have spent in Trove.Thanks Merron for Mention on your Blog . Would love to catch up with you in person , so many details you could fill me in with. Keep up the good work just love your Bligs . Kind regards Warren Gamble. I always enjoy your posts (even if I don’t always comment). Yes I can also take a long time with posts. I have had one brewing for 3 weeks about my families association with the Methodist church. I have scanned all the information and completed my research……..now to get time to write it!